We’re redesigning our Kpreps Kansas Game Day feature this week in order to provide you with a program for things to watch out for in Week 4 action. With Kpreps Game Day, we’ll look at an “under-the-radar” match-up in each classification, take a look at several rivalry games being played this week, and check in on any team or individual milestones. If you have suggestions for what you would like to see in future Game Day features, send us a message on Twitter or Facebook. Significance? – While the Centennial League race is really just kicking off (In an even numbered year, a school’s final six games against a league member count towards the league standings), Topeka High and Manhattan are among the contenders to compete for the league title. Topeka and Junction City shared the Centennial League title last season with each posting 6-0 records. Manhattan had earned at least a share of the league title in six consecutive seasons (2009-2014) until that streak was snapped last season. The Indians have Topeka High, Seaman, and Junction City remaining on their schedule; all of which are unbeaten in league play. Meanwhile, after tonight, Washburn Rural is the only opponent left on Topeka High’s schedule without a league loss. With the change in playoff format for Class 6A and 5A, each game is important for seeding purposes come playoff time. While five teams remain unbeaten on the western half of Class 6A entering tonight, Wichita South is one of those teams just outside the top tier contenders. The jury is still out on how good the Titans can be. South opened with wins over a pair of teams that are still winless in Wichita North and Wichita West before falling 21-6 to Garden City last week. Meanwhile, South and Kapaun Mt. Carmel are currently alone atop the Wichita City League standings at 2-0, with Wichita Heights (1-0) the only other unbeaten. While most of the early season attention has gone to the likes of Maize South and Buhler, Augusta is tied atop the AVCTL-III standings with the Mavericks and Crusaders. The Orioles opened with wins over Winfield, Clearwater, and Circle, but get their first true test this week at McPherson. The Bullpups opened the season in the 4A-I rankings, but dropped their first two games to Buhler and Maize South. If Casen Hoover can navigate the Augusta defense and linebacker Dallin Marlnee, McPherson has an opportunity to string together some wins before a competitive district that includes Hays, Wamego, and Abilene. Can this be a statement game for Scott City? The Beavers started the season 0-2 with losses to Hays (31-21) and Holcomb (32-13). Many had written Scott City off as the level of competition has been significantly elevated in the GWAC. But the Beavers have an opportunity tonight when they visit Hugoton. The Eagles are coming off a 24-21 home loss to Colby last week. Can Scott City ride the momentum from their 52-7 win over Cimarron and get back in the GWAC race? There is a lot of football yet to be played in the Tri-Valley League, but this one should go a long way in deciding who ends up on top. Cherryvale is off to a 3-0 start, but the Chargers three consecutive games against the upper echelon of the TVL. After tonight’s game at Fredonia, Cherryvale hosts Neodesha before traveling to Caney Valley. They then begin a challenging district against Galena and Riverton out of the CNC. After posting consecutive 5-4 seasons in 2014 and 2015, Fredonia seems to have a new confidence as a program this season. Maybe it’s new coach Marc Svaty, or maybe it’s the addition of running back Isaac McPherson. Either way, the Yellow Jackets have put up 112 points in the past two weeks, both wins. In the 74-58 shootout victory over Douglass, McPherson rushed for 421 yards on 24 carries. His twin brother, Isaiah, is a standout running back at Labette County. We don’t talk enough about the job John Guerrero has done at Syracuse. When Guerrero took over as coach in 2013, he inherited a program that had won 10 total games in the prior seven seasons combined. In the past two-plus seasons, Guerrero has led the Bulldogs to a 9-13 record including the school’s first playoff appearance since 2004. Syracuse (2-1) bumped up to Class 3A this season, and features a solid linebacker prospect in Mike Owens. Elkhart surprised some 2-1A followers with a 18-12 win over La Crosse in Week 1. The Wildcats returned 15 total starters from a season ago, including quarterback Tyler Sklenar and back Shon Villa. While the Hi-Plains League title always goes through Meade, the winner of this game could finish in the top three at season’s end, and both should contend for a playoff spot. Maybe the most intriguing game on this list, South Central and Hodgeman County will meet in a game that will be used as a barometer come playoff time in comparing playoff teams against these contending programs. Both teams are members of the Southern Plains Iroquois Athletic Association though they don’t have any other comment opponents. South Central (8M-I) plays in a district with teams from the Heart of the Plains and Central Prairie League, while Hodgeman County (8M-II) gets the difficult task of navigating a district that includes unbeaten Dighton, No. 2 Otis-Bison, and traditional power Sharon Springs-Wallace County. The Longhorns only loss came to defending 8M-I champion Spearville, 38-6 in Week 2. Junior quarterback Jacob Salmans leads Hodgeman County with 212 passing yards and four scores, while Carson Cohoon has four rushing scores. The Timberwolves also have an experienced signal-caller in Gerald Morehead. Morehead has passed for 123 yards and three touchdowns, and rushed for 455 yards and nine scores. Why not? We may have had a little something to do with this one. Each summer as Kpreps collects schedules from each school, we try and match up teams with open dates in order to ensure that each one has a chance to play their full allotment of regular season games. Late in the summer, McAuley Catholic (Joplin, Mo.) dropped their football program leaving St. Paul and a couple of other schools with a void in their schedule. Axtell happened to have a void too, so the Eagles and Indians will play Friday in St. Paul. The Indians are off to a 3-0 start including a 58-8 road win at Twin Valley League member Frankfort last week. Axtell, which plays their TVL rival Frankfort next week, is 2-1 after consecutive wins over Valley Falls and Southern Cloud. The Eagles defeated Valley Falls on Friday September 9th, and turned around to beat Southern Cloud in a varsity game on Monday, September 12th. Yes, defending champion Mill Valley is ranked No. 1 in Class 5A, and yes they have a big showdown with Class 6A No. 2 Blue Valley tonight. But the Jaguars are just beginning the most difficult part of joining the Eastern Kansas League. Friday’s home showdown with the Tigers begins three consecutive weeks against a ranked opponent. The next two weeks, Mill Valley travels to St. Thomas Aquinas and Bishop Miege. 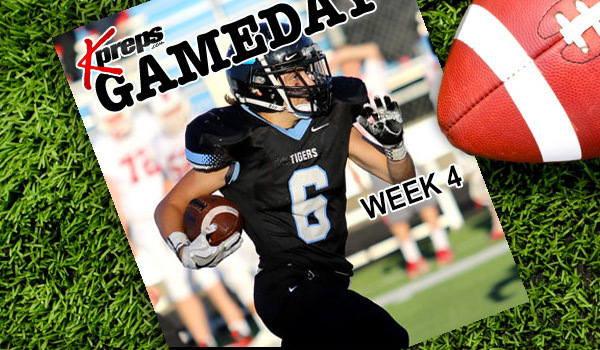 The Jaguars return home in Week 7 to host a solid Blue Valley North squad. Since exiting the Kaw Valley League a few years ago, the Jaguars did everything they could to strengthen their schedule in preparation to join the EKL. Over the next few weeks, we’ll find out if they can maintain the program’s elite status as one of the top in Class 5A. Mulvane is another team that needs to be playing its best ball right now. The Wildcats lost 61-52 to 4A-I No. 2 Andale last week and will try and regroup at 4A-II No. 3 Wichita Collegiate tonight. After battling the Spartans, Mulvane hosts 4A-I No. 3 Maize South and unbeaten Conway Springs in consecutive weeks. The Wildcats then begin district play with a long trip to traditional playoff qualifier Ulysses. Olathe South at Olathe East (CBAC) – It’s been a rough start for the four Olathe schools which entered Week 4 with a combined 2-10 record. Olathe East has one of those two wins thanks to a 20-14 overtime victory over Olathe Northwest. After being blown out in Week 1, Olathe South missed an extra point in a 21-20 loss to Olathe North. Both the Hawks and Falcons lost in last week’s Sunflower-Suburban Conference Showdown. Olathe South lost to Lee’s Summit 42-24, while East fell 21-14 to a ranked Liberty (Mo.) team. Olathe South holds a slight 14-13 all-time advantage over the Hawks in the series. Andover at Andover Central – Andover Central is looking for any momentum, and a victory against their cross-town rivals maybe what they need to get back on track. After reaching the Class 4A-I state title game last season, the Jaguars have started 0-3 against Andale, Buhler, and Abilene. Meanwhile, Andover is off to a 2-1 start under new coach Tony Crough. The Trojans posted wins over Salina Central and Kapaun Mt. Carmel before getting blown out by Goddard, 50-14, last week. Andover has won six of the past nine meetings in the series including a pair of wins in 2009 when the teams met in the playoffs. Andover Central won last year’s meeting 37-13. Fort Scott at Pittsburg – The two SEK League rivals meet for the first time as non-SEK league rivals. While Pittsburg left the league (in football only) to take on a challenging schedule as an independent, the Purple Dragons retained only Chanute and Fort Scott on their docket for 2016. Pittsburg shut out Chanute 44-0 in Week 2. Fort Scott rebounded from a 14-11 loss to Independence by beating Chanute 22-0 last week. Tiger back Zarek Fewell rushed for 232 yards in the win, but may find tougher sledding against an experienced Purple Dragon D-line. Goddard at Goddard-Eisenhower – Goddard has won three of four all-time meetings on the gridiron with Eisenhower’s only victory coming 34-28 in 2014. Expectations were high for Eisenhower after the Tigers’ run to the 5A state semifinals last fall. But Ike has opened 1-2 with losses to 6A’s top-ranked Derby and Maize. Goddard beat Olathe Northwest 27-26 in double overtime to open the season before losing at Derby 35-6 in a game that was called at halftime. The Lions rebounded by blowing out Andover 50-14 last week. Winfield at Arkansas City – The recent struggles of these two programs may have somewhat diminished the battle for the “Cowley Cup” between these two towns separated by 14 miles. But many remember the Vikings and Bulldogs have played some great games in this rivalry. This is believed to be the 75th all-time meeting between the two schools with Ark City holding a 50-23-1 advantage. Ark City has won the past three meetings overall, including the past two seasons after the two schools did not meet in 2012 and 2013. In fact, Ark City won only one game last season, a 42-25 decision over Winfield in the season opener. Chapman at Abilene – Dubbed as the oldest rivalry game west of the Mississippi, Chapman and Abilene are believed to have first met in 1892. Abilene has won the past three meetings and seven of the last eight in the series. The Irish’s last win came 29-28 back in 2012. Abilene is unbeaten on the season, while Chapman has dropped consecutive games to Southeast of Saline and Concordia after defeating Jefferson West to open the season. Can Belle Plaine snap a 31-game losing streak? The Dragons visit winless Northeast-Arma in a non-league game tonight. Belle Plaine’s last win came October 19, 2012 with a 19-14 defeat of Douglass. Hanzlick 4,000? Hoisington’s all-state running back Hunter Hanzlick is almost assured of breaking the 4,000-yard mark in his career tonight against Washington County. Hanzlick (5-11, 195) has 3,955 career rushing yards entering tonight’s game against Class 2-1A No. 5 Washington County. The Cardinals defeated the Tigers 50-6 in the second round of the Class 3A playoffs last season. In that game, Hanzlick rushed for 204 yards and four scores. What can Camacho do for an encore? Remember that 6-man league that has started in Western Kansas? It’s time to start paying attention. Golden Plains sophomore A. J. Camacho is doing his part to attract your attention. Camacho has already put up 826 all-purpose yards in the Bulldogs three wins this season. He has 217 passing yards and six touchdowns, 515 rushing yards and four touchdowns, and 87 receiving yards and two scores. In last week’s 49-0 win over Cheylin, Camacho rushed for 131 yards and two touchdowns, returned one of his two interceptions 79 yards for a score, returned a kickoff 70 yards for a touchdown, and a punt 55 yards for another score. A couple of schools were unable to field a team this fall, so Camacho and Golden Plains will travel to Cheylin for an “encore” again this week.